Knowing where to stand in the goal varies from goalie to goalie due to their size. Coach de Vries discusses the goalie ready position and how to grip the stick. You'll learn how to determine where your goalie should stand to make the best saves, how to be set for different angled shots, and how to position your goalie to stay balanced so they are ready for anything. Coach de Vries gives detailed examples of correct and incorrect form so you can see how the differences can impact play. Coach de Vries shows you multiple drills to get your goalie's feet ready to take on different shots. He also discusses the appropriate way to make gloves saves. The difference in footwork when goalies are clearing, especially near the mouth of the goal, is additionally covered. With his progressive drill segment, Coach De Vries demonstrates how to make a basic clear with the kick, then progresses to a kick save and stick save, ending with a foot, stick and glove save. 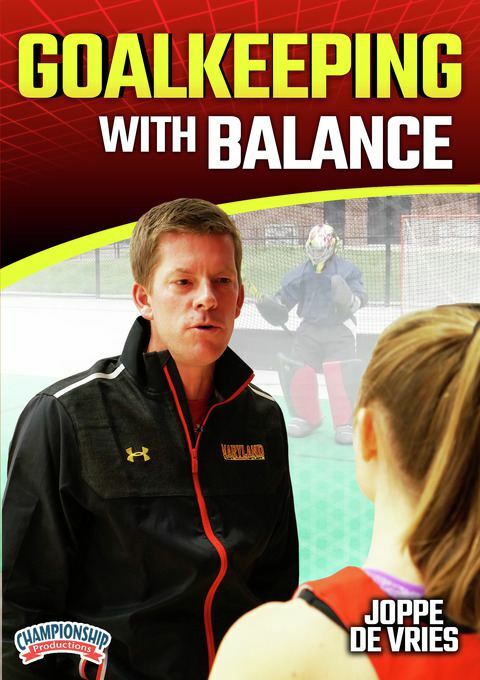 Coach de Vries shares a multitude of training tools to help your goalie react to unknown situations. You'll learn how to have your goalie react to aerial shots, bouncing shots, flat shot and much more. With fun and innovative drills and exercises, you will have a variety of tools to keep your goalie working on the fundamentals.